When their ageing Unix-based MRP system proved too expensive to upgrade, AGW reviewed several systems costing up to £100,000. They selected 123insight, as its monthly subscription was the same as the maintenance they were paying for their previous system. Since going live in 2007 the company has increased turnover by over 50%, added 123insight's CRM+, implemented the UL temperature classification and is also upgrading to ISO9001:2015. This '10 Years On' case study examines where the business has changed and how 123insight has helped them with continual improvements. 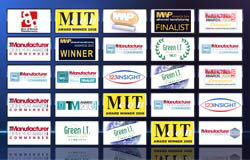 The original case study was Highly Commended in The Manufacturer 2009 awards and a Finalist in the Green IT awards 2010. 123insight was seen as the best MRP software for electronics manufacturing processes by AGW.